A Whoopie Pie is a sandwich made with two soft cookies or cakes and a sweet, fluffy white filling (or Marshmallow Fluff). The original whoopie pie used chocolate cookies, but gingerbread and pumpkin cakes are also used. The Whoopie Pie originated with the Amish in Lancaster County, Pennsylvania, but is also a well known comfort food in Maine (where it is the Official State 'Treat') and New Hampshire. Today they are increasingly sold throughout the U.S. 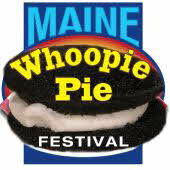 In 2010 Maine designated the Whoopie Pie as the Official State Treat. There are at least two Whoopie Pie Festivals: One in June each year in Dover-Foxcraft, Maine and another one at the Hershey Farm & Inn in Strasburg, Pennsylvania in September. (See Maine Food Festivals and Pennsylvania Food Festivals for details).